YouTube works well most of the time if you use a relatively new device to access the site even if you push the available video resolution to the maximum. The same cannot be said for low power devices, for instance the majority of computers that are five or even ten years old. 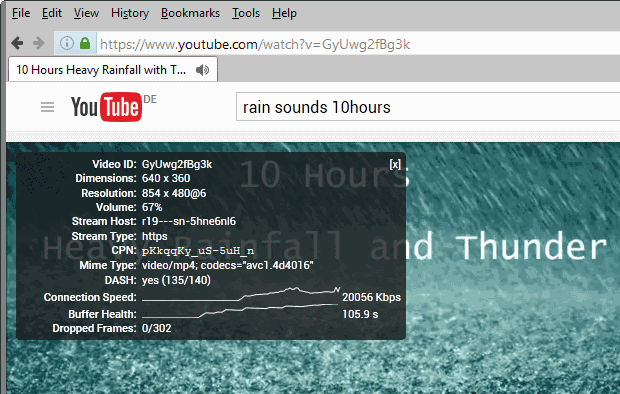 While YouTube works when you access the site, you may experience full load on the cpu, your laptop becoming hot like crazy, video stutter, battery drain, or other issues. While you may be able to reduce some by lowering the video resolution on YouTube, some issues might not go away even if you set the resolution to 320p or even 144p. Besides, while it may reduce the impact that the playing of videos has on the hardware, it may reduce the viewing experience at the same time. 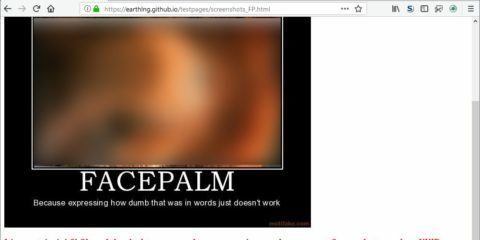 We talked about H264ify before here on Ghacks, when we reviewed the browser extension for Google Chrome. 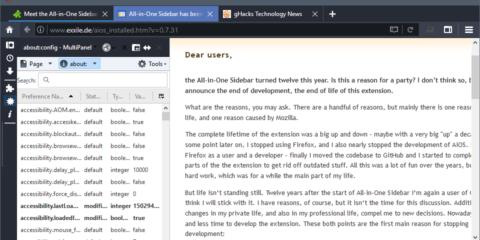 The Firefox add-on is developed by the same author using the same technology. Basically, what h264ify does to improve the YouTube experience is to switch the YouTube video stream from using VP8/VP9 to H.264 instead. The change is instant and not visible or noticeable to the user’s eye. One of the main reasons why h.264 streams may be better is that the format is commonly accelerated by the graphics processing unit (gpu) whereas the VP8 or VP9 formats are not usually. Hardware acceleration using the gpu reduces the load on the cpu which in term is beneficial to the viewing experience. You can check which format YouTube uses to stream videos by right-clicking on the video and selecting the “stats for nerds” option. This displays various information about the video stream including the mime type. This mime type should read video/mp4 when the extension is used, or video/webm when VP8 or VP9 are used. As far as options are concerned, there are only two. The first enables or disables the switching to h.264 which you may find useful at times. You can disable the extension as well for the same effect. The second setting blocks 60fps videos. If you are experiencing issues when playing videos on YouTube, you may want to try h264ify for Firefox or Google Chrome to see if it resolves or at the very least reduces the issue. While there is no guarantee that the extension will resolve it, it is one of the better options in this regard. It may also help users who try to play high resolution video on YouTube, say 1080p video, and notice dropped frames or jerkey playback. Now You: How is the performance for you on YouTube? The post Improve YouTube’s performance with h264ify for Firefox appeared first on gHacks Technology News.